Let's start with a yield curve, and why investors are interested in its shape. A yield curve gives a snapshot of how yields vary across bonds of similar credit quality, but different maturities, at a specific point in time. For example, the US Treasury yield curve indicates the yields of US Treasury bonds across a range of maturities. Bond yields change as markets digest news and events around the world, which also causes yield curves to move and change shape over time. 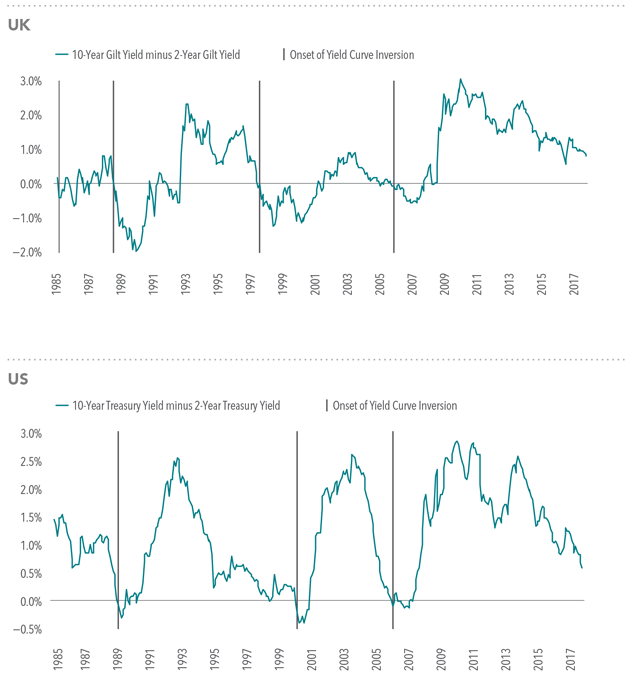 Historically, yield curves have mostly been upwardly sloping (short-term rates lower than long-term rates), but there have also been several periods when the yield curve has either been flat or inverted. One question often posed by investors is whether inverted yield curves predict a future stock market decline. While the handful of instances of curve inversions in the US may concern investors, the small number of examples makes it difficult to determine a strong connection, and evidence from around the world suggests investors should not extrapolate from the US experience. The inversion prior to the 2008 financial crisis is interesting to review. The US yield curve inverted in February 2006, after which the S&P 500 Index posted a positive 12-month return. The yield curve’s slope became positive again in June 2007, well prior to the market’s major downturn from October 2007 through February 2009. If an investor had interpreted the inversion as a sign of an imminent market decline, being out of stocks during the inverted period could have resulted in missing out on stock market gains. And if the same investor bought additional stock once the curve’s slope became positive, they would also have been exposed to the stock market weakness that followed. 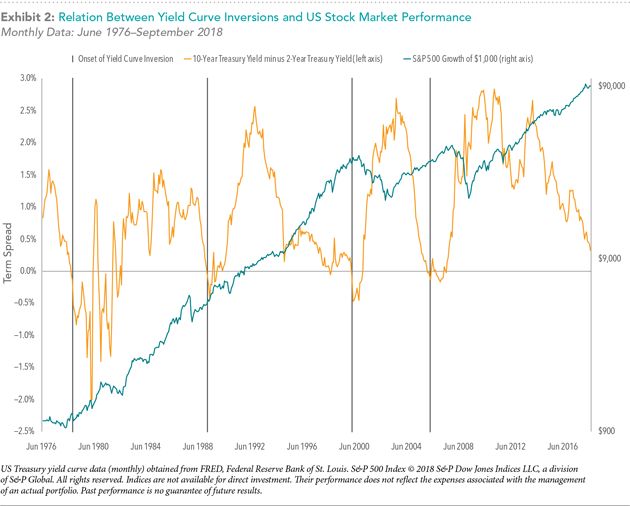 The small number of US yield curve inversions over the last 40 years makes it challenging to draw strong conclusions about the effect on stock market performance. We can, however, look at other countries to gain a better sense of the relation between inversions and subsequent market returns. 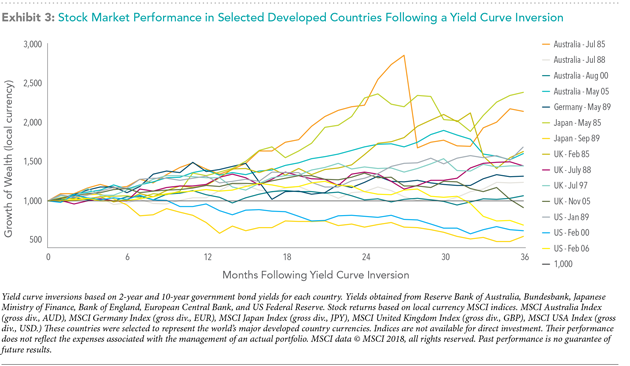 Exhibit 3 shows the hypothetical growth of 1,000 of the country's local currency invested in the local stock market index the month before yield curve inversions began in five major developed nations, including the US, since 1985. These results show that it is difficult to predict the timing and direction of equity market moves following a yield curve inversion. 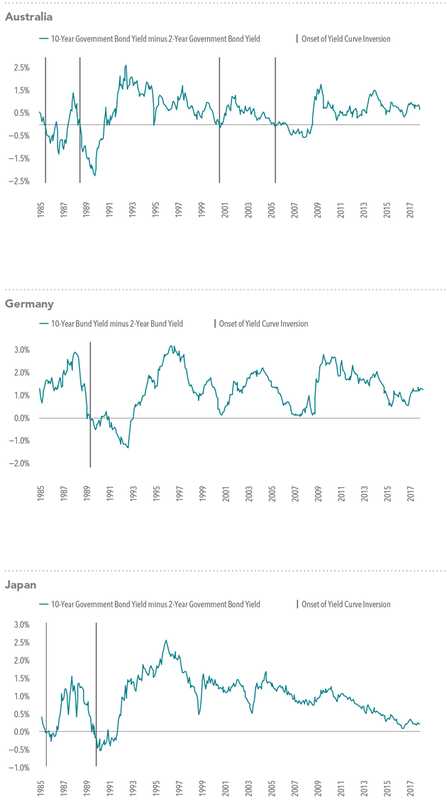 Though the data set is limited, an analysis of yield curve inversions in five major developed countries shows that an inversion may not be a reliable indicator of stock market downturns. So, what can you do if you are concerned about potential equity weakness? 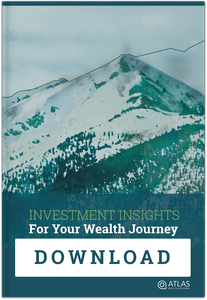 By developing and sticking to a long-term plan that is in line with their risk tolerance, investors may be better able to look past short-term noise and focus on investing in a systematic way that will help meet long-term goals. 1. Term spread is the yield difference between bonds with different maturities but similar credit quality. 2. The data showed a 71% chance (10 of 14) of a three-year positive return following a yield curve inversion. To compare, we measured returns three years following every month-end between January 1985 and December 2014 in each of the five markets based on the local currency MSCI indices. The average chance of a three-year positive return in those five markets was 77%. Diversification does not eliminate the risk of market loss. Investment risks include loss of principal and fluctuating value. There is no guarantee an investing strategy will be successful. Past performance is not a guarantee of future results. Indices are not available for direct investment; therefore, their performance does not reflect the expenses associated with the management of an actual portfolio.